MarketSaw - 3D Movies, Gaming and Technology: We Are Wrapped!! 40 BELOW AND FALLING Enters Post Production! We Are Wrapped!! 40 BELOW AND FALLING Enters Post Production! We're wrapped! Into post we go. What a journey so far and I'm thrilled to be a part of such an awesome movie. I'll be sure to keep you all up to speed on happenings in post production as well and we have some surprises in store for you! EDMONTON - That’s a wrap! Filming in Edmonton is officially complete on 12pt Media’s 3D Romantic Adventure/Comedy 40 Below and Falling. The film stars actors Jewel Staite (Firefly, The Killing) and Shawn Roberts (Resident Evil) along with a superb Canadian support cast that includes Cindy Busby, Shaun Johnston, Mark Meer and Hollywood trained grizzly bear Whopper from Innisfail, Alberta. 40 Below and Falling tells the story of Kate Carter (Jewel Staite), a small town school teacher who is moving back to the big city for her wedding. When a blizzard strikes, her flight gets cancelled and the roads are shut down, leaving Kate no choice but to hop on the back of a surly stranger named Redford’s (Shawn Roberts) snowmobile. As they battle the winter elements together and their adventures unfold, Kate slowly starts to question the choice she has made about the man she is set to marry. The movie was filmed in Edmonton and various locations across Alberta with a custom manufactured beam-splitting rig. 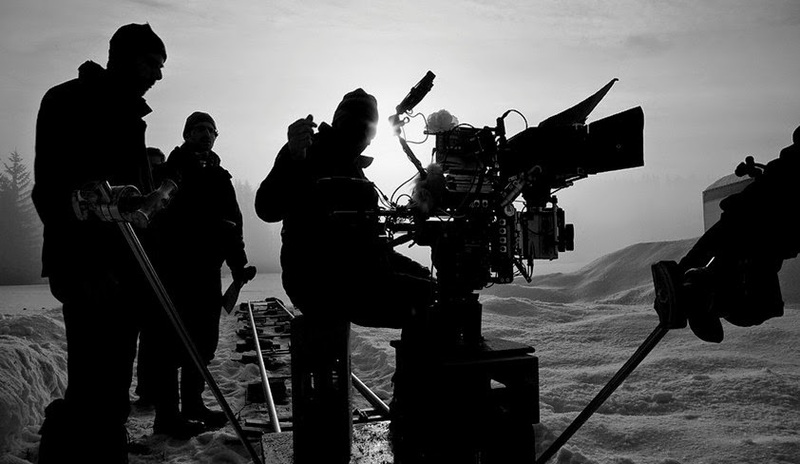 This cutting-edge technology allowed the team to effectively shoot in freezing Canadian temperatures with reduced setup times for all of the film's remote locations. The feature is now entering into post-production, utilizing Davinci Resolve, AVID, NUKE and After Effects to meet its quick delivery date at the end of May. The complicated workflow involves over 150TB of data and is being managed in house by 12pt Media. Executive Producers Darren Arsenault, Corinne Ferguson, Pierre-Andre Rochat, Producer Andrew Scholotiuk, Associate Producer Jim Dorey, along with the crew, are hard at work behind the scenes getting the film ready for its expected release in the fall of 2015. 40 Below and Falling is currently scheduled to be broadcast in Canada in 2D on Super Channel, with an international release being handled by distributor DARO Films out of Monaco. Produced in association with the Edmonton Film Fund and with the assistance of the Government of Alberta Media Fund and the Canadian Film or Video Tax Credit Program. Stay up to date on the film’s adventures and get in on some of the behind the scenes action by following 40 Below and Falling on Facebook, Twitter and Instagram.